50mm x 40 metre roll of Yellow Continuous Vinyl with self adhesive for Labelstation printers. Available In stock for fast dispatch. Shop Now! Blue Standard Address Labels suitable for use with Dymo LabelWriters, Labelstation, Zebra and most thermal transfer printers that accept a 25mm (1 inch) core. Blue Standard Address Labels suitable for use with Dymo LabelWriters, Labelstation, Zebra GK, GC, GX Series and most thermal transfer printers that accept a 25mm (1 inch) core. 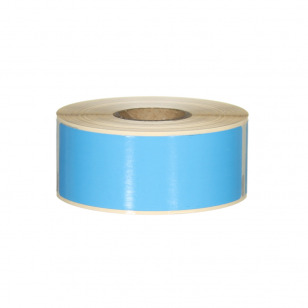 1x roll of 89mm x 28mm Blue Standard Address labels, 260 labels per roll.